Save your cardboard toilet-paper tubes - they are very handy for purposes like this. Cut each tube in half so that you have two short, squat little cardboard cylinders. Cut four half-inch slits from the bottom up. If it were a clock face, cut it at 12 o'clock, 3 o'clock, 6 o'clock and 9 o'clock. 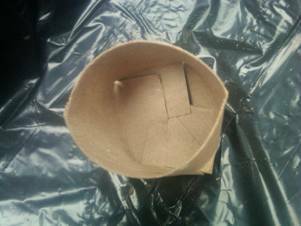 Fold these flaps inward and up slightly, tucking them under each other, so that you have made a bottom for your cardboard pot that will pretty much stay together. Place two or three inches of clean pea gravel in the bottom of a plastic tub. Place the toilet-paper "pots" side by side on top of the gravel. Fill each pot almost all the way up with soil-less seed mix. Spray-mist with warm distilled water. Sprinkle a seed or two on top and sift just a little more soilless mix on top. Label your seeds! Spray-mist again. Cover all with clear plastic wrap. Put in a warm place for a week or two to germinate. As soon as the seedlings appear, remove the plastic wrap. Set them out under indoor grow lights, or in a sunny, south-facing window. 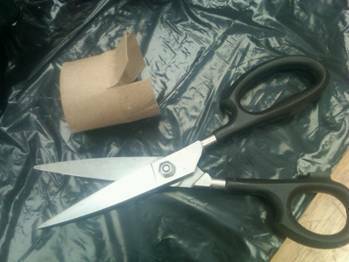 You can also use paper towel rolls, and cut several pots out of each roll. When the seedlings are up and doing well, you can carry the tub out to the garden and transplant them on the spot. You can slide each rootball out of the cardboard pots and plant. Or open the bottom of each cardboard pot up with scissors and slice further up the side before you plant. This will make it really easy for the roots to grow down and out as the cardboard decomposes, which might take all summer and you don't want to trap the roots inside. Besides, the cardboard tube gives the new seedling support as it gets established outside.